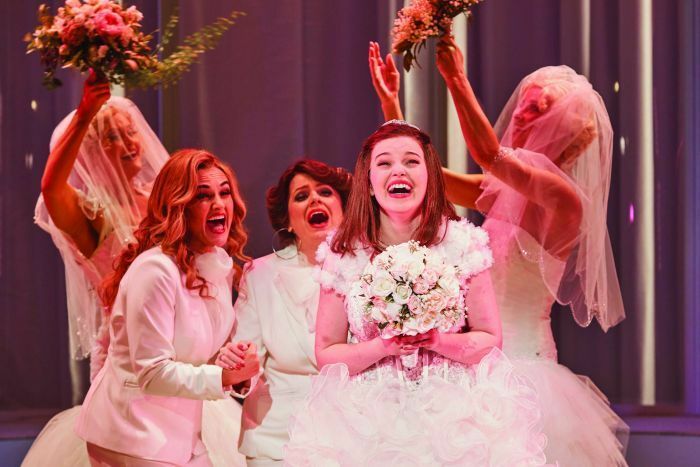 Muriel’s Wedding The Musical scored big in Sunday night’s Helpmann Awards ceremony “Act 1” at Sydney’s Capitol Theatre — the first of two ceremonies, and the first time Live Performance Australia has split its annual awards event. Sunday’s ceremony focused on awards for supporting, craft and technical roles, with 20 awards presented. The remaining 23 awards will be presented in a second ceremony on Monday night. Muriel’s Wedding The Musical, a co-production between Sydney Theatre Company and Global Creatures, took out five awards: Best Costume Design (Gabriela Tylesova), Best Original Score (Kate Miller-Heidke and Keir Nuttall), Best Choreography (Andrew Hallsworth), Best Music Direction (Isaac Hayward), and Best Sound Design (Michael Waters). Muriel’s Wedding The Musical returns to Sydney in 2019. It was a good night for Sydney Theatre Company elsewhere, too, with Anita Hegh winning Best Female Actor in a Supporting Role in a Play for The Resistible Rise of Arturo Ui (directed by STC artistic director Kip Williams), and Sarah Goodes taking Best Direction of a Play for The Children (a co-production with Melbourne Theatre Company). Bangarra Dance Theatre had a successful night, with its production Bennelong taking home Best Choreography in a Ballet, Dance or Physical Theatre Production (Stephen Page AO), Best Lighting Design (Nick Schlieper) and Best Scenic Design (Jacob Nash). Bangarra’s Our Land People Stories won Best Regional Touring Production. Beautiful: The Carole King Musical won three awards: Best Direction of a Musical (Marc Bruni), Best Male Actor In A Supporting Role In A Musical (Matt Verevis), and Best Female Actor In A Supporting Role In A Musical (Amy Lehpamer). Act 2 of the Helpmann Awards takes place Monday July 16 at Sydney’s Capitol Theatre, and includes performances from the stars of Muriel’s Wedding the Musical and Priscilla Queen of the Desert The Musical, dancers from Sydney Dance Company, and the vocalists from Sydney Symphony Orchestra’s concert production of Funny Girl. Helpmann Awards Act 2 will be broadcast on ABC TV Monday July 16 from 9.35pm. Catch up anytime on ABC iview.